The original Collie Standards tell us what the early collies looked like. It is important to remember, however, that the Scottish rough coated Collie was carefully bred for the job of herding sheep in the rugged and daunting terrain of the Scottish Highlands long before the first Scottish Collie Standards were written. Sheep or cattle were, and still are, the only possible agricultural use for this beautiful, but wild and inhospitable, mountainous land. Even today, in the remotest areas, there are no roads, just tracks which cross through the middle of the Highlands. Much of the land is inaccessible by motorized vehicles. The weather is a further challenge. Even in the warmest months, Scotland’s Highlands can rarely ever be considered very warm by any standards. In winter, they can be daunting indeed, with storms and gales blowing in from the North Sea. Scotland is surrounded by seas on three sides: East, West, and North coasts. The storms which do blow in are a constant hazard to people tending sheep in the remote areas. The weather is quite unpredictable and changes very fast. You can be sure, that if it isn’t actually raining, or sleeting, or snowing, during the colder months, before many hours have passed it will be. Weather systems are fast moving, because nowhere in Northern Scotland are you more than sixty or seventy miles from the sea. A good collie dog became a necessity to manage the large flocks of sheep grazing on unfenced land, and wandering over wide ranges in search of grazing. Just as a good shepherd knows his sheep, and they in turn know and trust him, so, too, does the working Collie know his own sheep, and they him. Sheep could become lost and buried in snow, especially when lambing in the early spring. A good Collie could track and find these lost sheep separated from the main flock. 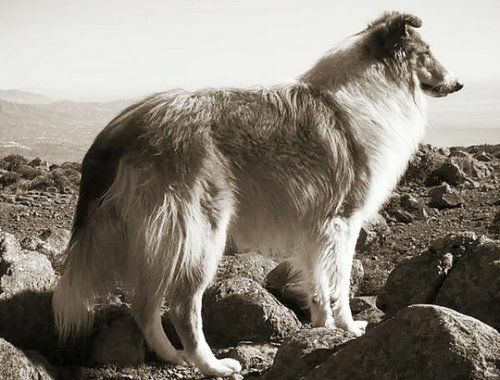 The Collie’s sense of direction is legendary, and is described in many fictional stories, like Lassie Come Home by Eric Knight. These stories were, in fact, based on many enduring and true accounts of the Collie’s remarkable homing instincts, and ability to find the way home, even through new terrain. The Collie, over many hundreds of years, has carried the bred-in ability to track and find lost sheep, then return them home to farm or shepherd’s croft, often completely independently. Theories abound as to the origin of the Scottish Collie breed. However, it is generally accepted that the Scottish Collie traces back to 4000 BC, to dogs owned by the Celts and used for herding. The Celts controlled and inhabited Ireland, Scotland, Wales, and parts of England from 4000 BC until 43 AD. At this time the Roman conquerors arrived and so began the Roman Occupation of Northern England and the more southerly parts of Scotland. The Romans brought with them their own herding dogs which were then interbred with the Celtic dogs. In 410 AD the Romans left, but their dogs’ genetic influence remained. Next came the Anglo Saxon invaders from northern Germany, Denmark, and the Netherlands, with their European herding dogs which again added to the development of what would eventually be called the Scottish Collie. In 793 AD the Vikings arrived, bringing from Norway their own Herding Spitz dogs. During the long period of Viking influence, the Norwegian Spitz Herding Dog contributed to the genetic mix of other European herding strains and all were added to the local Celtic working dog. This diverse genetic combination added to the local Celtic Collie dogs, eventually produced the Scottish Collie, both Rough and Smooth. In the period between 1066, when the Normans conquered Britain, up until approximately 800 years later, there were no further infusions of foreign herding breeds. The herding dogs were, however, definitely improved through selective breeding. The careful selection for breeding of good working dogs resulted in an unequalled herding dog, useful not only to the Scots, but to those in the northern part of England and Ireland as well. This Collie dog from the Highlands became the root breed for all of the other herding breeds which developed in the UK, and later spread around the world. The Collie is essentially the dog it is because for thousands of years it performed sheepdog work in a specific and unique way which is characteristic of these Highland Scottish Collies alone. This very essence of a Collie, and its unique way of working is something that cannot be lost, or bred out, or forgotten, or erased from its gene pool. It had to be so, because of the very particular environment where the Collies’ work was performed – the Scottish Highlands. It should never be forgotten that the Collie was developed in the Highlands, because all the rest comes out of that. During the time before dog shows existed, before the Standard was written on paper, sheep were the most important and most numerous animals in the British Isles. Life centered around the raising of sheep; but working such large flocks of sheep was not possible without dogs. Small wonder so many varied types of British sheepdog breeds developed as these Collies of all types were used for many different purposes throughout Scotland, England, Wales, and Ireland, serving the varied demands of the quite different environments. 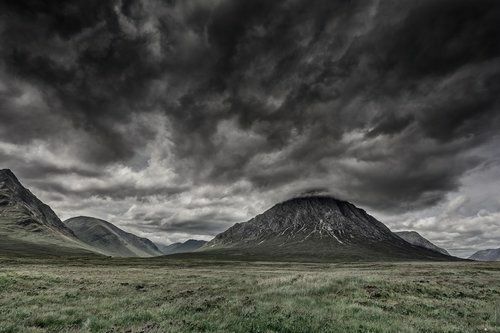 The Scottish Highlands, though beautiful, can also be both bleak and lonely. The main threat for shepherds and their flocks was the weather, at a time when no weather forecasts were available by either radio or television. Many remote places in both northern England and Scotland still have no electricity, or reception for radio, television, or cell phone. During spring, and even very occasionally during the summer, the weather in the Highlands can shift extremely fast from a bright sunny day to snowstorms, blizzards, and freezing temperatures due to exposure to the North Sea and cold, strong Arctic winds.Flocks grazing in the Highlands are vulnerable to these rapid weather changes, especially during the lambing season. During a storm, a panicked flock can run themselves into real danger in rugged terrain where dangers abound. Collies were there to prevent this happening. Many adaptations were bred into the Collie over the long history of its existence to make it the very best possible dog for this daunting work of herding in the Highlands.The Collies’ ears, which are semi-erect and shell shaped, could catch sounds in the most efficient manner. These wonderful tipped ears allowed them to hear; the sound of wind coming from high hills and mountain slopes long before it actually swept the ground, the bleat of a lost sheep or lamb, even in a storm or blizzard, the shouting or whistles of the shepherd giving directions in the storm. Collies are extremely sensitive to sounds, and their hearing is better than most dogs. They don’t like loud noises, loud singing, or fireworks, or thunder. Collies still often feel very uncomfortable with the noise of strong wind blowing, and not without reason. Wind is a danger, and their senses are warned. This sensitivity was bred into Collies for a purpose. Good hearing made it possible to act in time gathering the flock, keeping them together and then bringing them home to safety and shelter. The Collie coat, waterproof and warm, was designed to protect against the rain, sleet, snow and blizzard conditions. The outer hair is coarse on the top, but woolly and thick underneath. Collie coat colour, and markings also served a valid purpose being more easily seen by the shepherd and by the sheep in bad weather conditions, or in the dark. The Collie eye was also used to good advantage. Stories abound of collies, who turned away a stubborn ram towards the safer route. So powerful, must be the eye of a Collie, and his sense of presence, and dignity, and air of command. Even the lovely Collie tail, or brush, serves several useful purposes. It is designed to preserve his balance in quick turns, while moving sheep in the desired direction. Even the white spot on the tail tip is there to shine in the darkest night like a lighthouse making the dog visible to both shepherd and sheep. Lastly the tail, when curled round a Collie sleeping in freezing conditions, adds warmth, as it covers legs, feet and nose. Vincent Von der Prignitzer Flur of Astromelia Collies. Imagine the ground collies had to cover daily while looking after their sheep over rocky and steep countryside. There were, and still are, really no fenced pastures in the Highlands. It was necessary to stay with your flock while they were grazing. Such work requires a very skilled, nimble mover, not too heavy to be able to cover such ground, safely and yet with stamina for great distances and long hours of work.The Scottish Collie Preservation Society Standard is an amalgamation of the earliest Scottish Collie Standards. Under General Character it calls for:A lithe, active dog, his deep chest showing lung power, his neck strength, his sloping shoulders and well bent hocks indicating speed, and his expression high intelligence. He should be of fair length on the leg, giving him more of a racy, than cloddy appearance. In a few words a Collie should show endurance, activity and intelligence with free and true action.There are serious consequences to ignoring the genuine purpose for which the Collie was created. Although the Collie makes a wonderful companion dog, a loving minder of children, and is beautiful; to forget its long history and important role as a working sheepdog will not assist us in our efforts to restore the good health, intelligence, character, temperament and popularity of this remarkable breed, one of the oldest and noblest of all dog breeds. The Collie still should have the form and characteristics which fit his function as a working sheepdog. For this reason the Scottish Collie Preservation Society was formed, and chose to use the original Standards for the Scottish Collie (1885 to 1910) as the guide to returning the Collie to its more moderate form, with balance and harmony, as the most beautiful of the canine race.